Using PC-Telephone you enjoy proprietary PC to Phone and PC to Fax calling technology with clear, reliable calls anytime and anywhere. The audio compression supported delivers the voice with an amazing quality over broadband as well as over narrowband Internet connections. In this way, your PC-Telephone calls sound and feel like regular phone calls. The calling account expire one year since the last recharge. To extend your calling time, simply recharge your calling account. 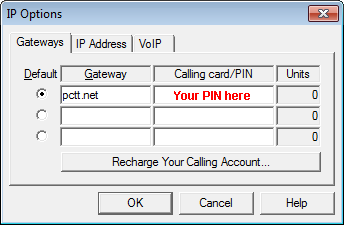 You can also use the PC-Telephone calling PIN on your mobile phone SIP dialer to make cheap PC to Phone calls over WiFi or Mobile Internet. Select your calling credit and use the available payment options. Upon receipt of your order we will email you a calling PIN enabling PC to Phone/Fax calls. Dial in the Phonebar: #123, where 123 is the phone/fax number you like to call (country code + area code + local number). The phonenumber should consist of only digits without the leading zeros.